Save and compare credit cards to find the best fit for you. All you need to do is find cards you like and check the Compare This Card box. When you’re ready to review, click the compare button that appears in this menu. Congratulations! You’ve added your first card to My Saved Cards. Make sure you log in to keep your cards saved for your next visit. An error has occurred. Try again later. The card has attractive bonus categories and an easy to use mobile app. To call the customer service inconsistent at best, is as much of a compliment as I can muster. I highly recommend pursuing other dining cards from issuers with attentive, consistent, and knowledgeable customer service agents. I have two of these cards (because of the attractive sign up bonus). I would recommend seeking alternatives in case you should ever run into an issue where you need to count on the issuer. Other cards that have replaced these in my wallet are the Uber Visa and Amex Gold cards. Head and shoulders improvements in customer service experiences. These reviews were written by current and former cardholders in the last year. $237 back in 6 months! I have an older version of this card that didn't offer such a big sign-on bonus, but I still accrued almost $240 cash back in 6 months with intermittent restaurant and entertainment spending. While previously capped at 3% cash back like the SavorOne is, the new 4% back now even applies to things like botanical gardens, men's chorus, and modern dance shows. The cash back can be used as soon as it shows up on the statement, and it can be applied directly to the statement, a specific purchase, a gift card from one of dozens of retailers, a check directly to you, or transferred to another C1 account. I also received 0% on purchases and transfers for over a year, but I'm not sure if that still applies. The older version also continues all the improved benefits at no annual fee which is super sweet. Hopefully they keep that promise. The $500 cash back in 3 months on the new version is just insane! Had it for about a month and a half now, got approved on 720/740 CK/Experian (oddly, their model rated me 698 based on the blurb in the welcome package), we eat out a lot and large expeses for entertainment, so going for the 4% card at annual fee was a no-brainer for me. Extremely happy with the whole online interface, the way the card rewards are instantly calculated and available, granted there are some grey areas, where restaurants in hotels can be billed as "hotel" rather than dining, depending on their respective billing practices, but that is a general issue and I would not hold it against the card. Have not had to interact with customer service yet, so, can't comment on that. In terms of features and everyday management I am currently extremely satisfied, received the welcome bonus the second the respective charge was processed. Application process was easy online, they checked for pre-approved offers, which I didn't have, but instantly cleared me for a decent credit line. Card arrived reasonably fast. App and website great to use. If you're dining/entertaining, this is for you. Just curious did they use FICO Score 8 or 9? I got grandfathered in after product changing to the original savor from a quiksilver . No bonus for me. While this is an amazing card, I don’t use it at all besides the entertainment portion. My AMEX Gold gives the 4% dining and supermarkets, which is where this should’ve been if it’s for foodies. My Sapphire Reserve gives 3% back, but the points are worth more. You have to pay an annual fee to American Express to get 4% on dining, where you don't pay any annual fee for a grandfathered Savor. What a great card. High sign up bonus and restaurant cash back is through the roof. Easy approval and decent customer service. Appoved in minutes!! Limit was higher than I expected!! Capital one always comes though for me. I absolutely love them!! This is my go-to card for everything! Great rewards program! Great customer service! You can't go wrong with Capital One! Awesome card... Got grandfathered in so I get to skip the yearly fee. Even with the yearly fee if you use it enough you will definitely make your money back. Started with a 10k line and combined all my other Cap one cards to this card so the line is currently just north of 45k. It's extremely easy to combine lines through capital one... Redemption is easy, the rewards show up quickly, just overall a great card! I didn't realize you could even combined your lines of credit like that through any card company but have thought it would be great if you could. Seeing you are the very first person I have ever seen mention it I want to Thank You so much. I'm going to look into this, You would think this would be talked about often. I kniw alot of people need to juggle their cards.. inactivity isn't good so of course we try to use our cards as often as possible to avoid losing them and the total overall credit limits. I see you stated that Capital One is easy to combined all your cards, Do they just combined it to your most recent card or do they give you that option. ..? Either Way.. To Me its a No Brainer. Much Appreciated Thanks again . What motivated me the most to get this card was the $500 bonus (after spending $3000 in the first 3 months). I paid my rent using the card to meet that $3000 rthreshhold in 3 months. 4% on eating out and entertainment is good but I don't think it's enough to cover the $95 fee after the first year so I will probably cancel at the end of the first year. Or you can switch to the Savor One card, which is the identical card minus the $95 fee and 3% on restaurants and entertainment instead of 4%. Taking 1% less means you can spend $9500 less per year to cover the annual fee. You need to spend over $9500 in dining and entertainment in order to justify the annual fee. 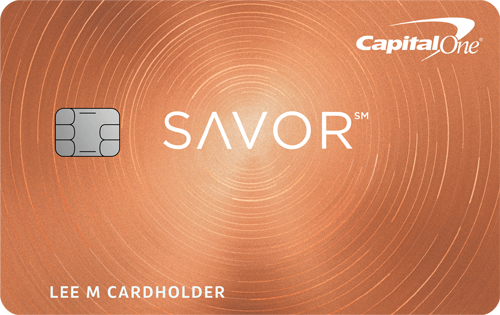 With the Savor card, you only need to spend $2,375 annually on dining and entertainment to cover your $95 annual fee. If you have a family or go out with friends often and are willing to pick up the entire bill and have your friends pay you back in cash, that number shouldn’t be too hard to hit over the course of a year. Yeah but why sign up for rewards for the rewards to just pay your annual fee. That defeats the purpose. Get the two percent back from a free rewards card and actual get something from it. This card is literally for the $500 reward. Great rewards program, if my reserve changes their program for the worse, this would be my main card. If you dine out often and spend money on movies, theme parks etc then this card is for you. No foreign transaction fees, the app is beautiful and the customer service is great. Hope they never change a thing! How would you rate this card overall? What should others know about this card? See the online Provider's credit card application for details about terms and conditions. Reasonable efforts are made to maintain accurate information. However all credit card information is presented without warranty. When you click on the 'Apply Now' button, you can review the credit card terms and conditions on the provider's website. † Credit Karma looks at how your credit profile compares to other Credit Karma members who were approved for this product. Of course, there's no such thing as a sure thing, but knowing whether your Approval Odds are Very Good, Good, Fair or Poor may help you narrow down your choices. ‡ Average score refers to the arithmetic mean and typical low score to the 5th percentile of, in each case, available VantageScore 3.0 credit scores provided by TransUnion of Credit Karma members who were approved for this product from June 2014 through November 2014. Average and typical approved scores are provided as guidelines only and approval is not guaranteed. You can learn more about credit card approval through our in-depth article. The ratings and reviews are brought to you by our users. Banks, issuers, and credit card companies do not endorse or guarantee, and are not responsible for this content. Advertiser Disclosure: The offers that appear on this site are from third party advertisers from which Credit Karma receives compensation. This compensation may impact how and where products appear on this site (including, for example, the order in which they appear). It is this compensation that enables Credit Karma to provide you with services like free access to your credit scores and free monitoring of your credit and financial accounts at no charge. Credit Karma strives to provide a wide array of offers for our members, but our offers do not represent all financial services companies or products.